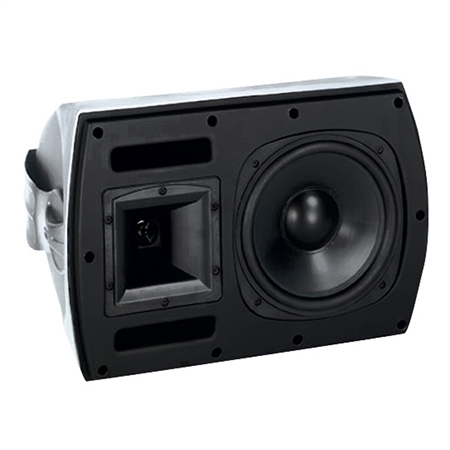 The Klipsch CA-8T compact full range system is perfect for higher power professional applications where flexible mounting and extended range are required including everything needed for fast and easy distributed sound installations. Equally at home indoors or out in foreground or background higher spl applications the CA-8T's appearance and Klipsch fidelity fit into residential business or recreational environments equally well. The UV- and weather-resistant ABS enclosure includes an internal multi-tap transformer with switchable direct 8 ohm bypass simplifying hookup to any type of sound system. The C-bracket assembly attaches to the enclosure's integral stainless steel threaded studs with oversized knobs ensuring a positive position-lock and rapid "no-pain" installation. External attachment to the built-in security retainer provides an extra measure of safety protecting against unexpected damage or removal. The CA-8T includes a high power 8" extended range low-frequency driver and a 1" titanium diaphragm compression driver on a molded Tractrix Horn. The 90º x 60º horn and driver assembly allows repositioning by 90º for selectable pattern control. The compact dual port bass reflex loudspeaker system can handle 100 watts continuous power for an AES sensitivity of 96dB and a maximum output of 113dB spl. Paintable and available in black or white finishes the ABS enclosure features corrosion- and rust-resistant stainless steel hardware and a removable aluminum powder-coated grille ensuring maintenance-free service in any environment or application. Whether indoors or out the Klipsch CA-8T is the good looking great sounding full-range solution for installed high-fidelity sound.